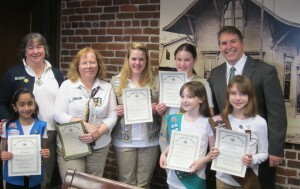 Local Girl Scouts and their leaders meet with Marlborough Mayor Arthur Vigeant. (front left to right) Daisy Anjali Sangappa, Junior Eliana Himle and Brownie Angel Chaulk. (Back left to right) Service unit leaders Bonny Goldberg and Nancy Theis, Ambassador Sarah Symes, Cadette Betsy Goldberg and Vigeant. 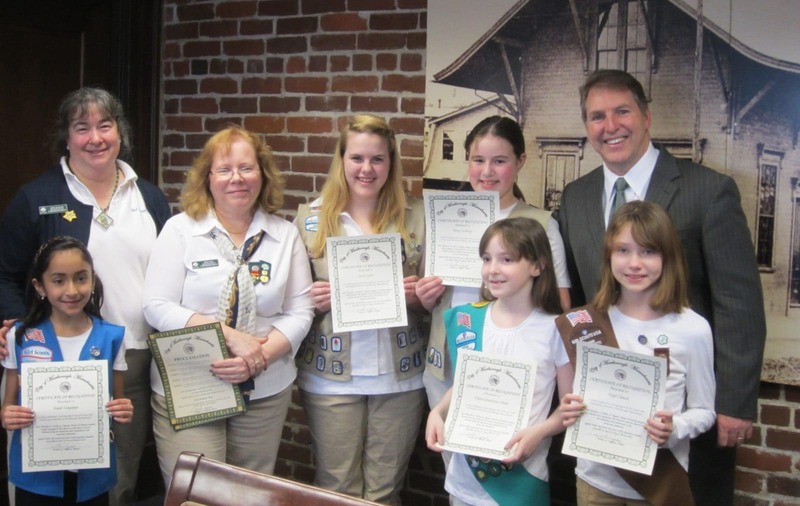 Marlborough –Mayor Arthur Vigeant honored the city&apos;s Girl Scouts on Monday, March 12 on the occasion of the national organization Girl Scouts of the United States of America&apos;s 100th birthday. Five girls, representing the different level of Girl Scouts – Betsy Goldberg, Cadette; Sarah Symes, Ambassador; Anjali Sangappa, Daisy; Eliana Himle, Junior; and Angel Chaulk, Brownie – participated in the ceremony held at City Hall. Bonny Goldberg, a Service Unit leader for the Scouts (and Betsy&apos;s mother), noted that the girls had written to Vigeant and asked if he would meet with them to help commemorate the occasion. He readily agreed, she added. Vigeant presented the girls and their leaders with an official proclamation designating March 12 as “Girl Scout Day” in the city. He also gave each girl a certificate honoring them for their contributions to the Scouts and an official city of Marlborough pin. Also present at the ceremony were Steve Dembro and Rebecca Tilly from local restaurant Stevie&apos;s Eatery. Dembro has on occasion closed down the restaurant and opened it up to local troops so that they can learn not only cooking basics but also business and management skills. Dembro does not have children of his own, he said. Helping the girls was his way of “giving back to the community,” he said. Later in the evening the girls were scheduled to join Scouts from across the city for a “Promise Circle” that was to be held on the city&apos;s common.